Your second visit usually will last about 30 minutes. During that time, Dr. Hurd will meet with you to show you the findings of the exams and share the care plan he has recommended specifically for your individual case. Again, we don’t know what patients have learned before their visit to our office and it’s very important to us that you’re able to make informed decisions regarding your body. 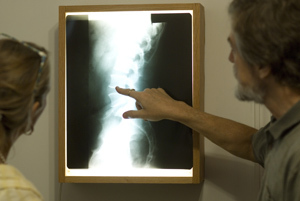 After meeting with the doctor, chiropractic patients will then proceed to the adjusting area for their adjustment. Dr. Hurd will explain the techniques he’ll be using specific to your body. Some patients are more comfortable with gentle techniques and others prefer more aggressive. He is both gifted and expertly proficient with many techniques allowing him to care for many kinds of patients presenting with different needs and preferences. After the adjustment, the front desk will assist in making future appointments and confirm financial arrangements. Nutrition Response Testing patients can expect Dr. Hurd to offer a clear understanding of the exam findings and at that point can choose to begin the process of implementing the recommendations specific to their needs. The front desk will assist in financial arrangements, purchasing supplements, and future appointments. Other than the initial visit, NSRT / BAX appointments generally take about 20-30 minutes. If a patient is under severe stress or has had a head injury since their previous visit, additional protocol may be required.